This website provides community information about the use and rental of the Masonic Temple Building facilities at 5th and Warren in Bremerton, Washington. History: The Freemasons of Washington are members of a Fraternal Organization dedicated to making good men better and thereby making the community better. Two Masonic Lodges, chartered by the Grand Lodge of Free & Accepted Masons of Washington, are co-located at the historic Victory Memorial Masonic Temple. These Lodges are: Bremerton Lodge #117 and William H. Upton Naval & Military Lodge #206. Lodge 117 was constituted in 1902 and Lodge 206 was constituted in 1915. Through a property transaction with the Episcopal Church in 1915, the church was moved from 5th and Warren to Chester and 6th Streets. 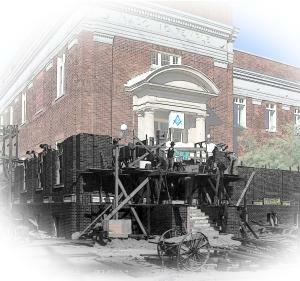 The Victory Memorial Masonic Temple cornerstone was laid at 5th & Warren in 1919 and the building was completed and dedicated on May 8th, 1920. The building is owned by the Masonic Temple Board which is comprised of stock owners from the constituent Masonic Bodies that use the Temple.